What is a Technician Appointment? 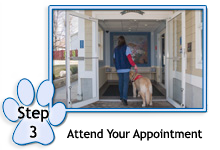 Your pet is going to have a comprehensive physical examination with one of our dedicated veterinarians. In addition to this exam, it is crucial for our staff to learn from you any information that may indicate illness or injury in your pet. Please use this form as a guideline to note any abnormalities you have noticed that may need special attention. Does Your Pet Exhibit ANY of These Symptoms? Are There Any Behavorial Issues You Would Like to Discuss? Do You Kennel Your Pet? Do You Use Heartworm Preventative Year Round? If Your Pet is a Cat, Does It Go Outdoors? 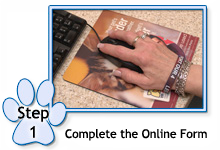 Do You Use Flea Protection? Is there any other information that we should know about in order to provide the best care possible? By submitting this form, I hereby authorize the veterinarian to examine, prescribe for, or treat the above described pet. I assume responsibility for all charges incurred in the care of this animal. I also understand that these charges will be paid at the time of release and that a deposit will be required for surgical and or medical treatment. I certify that I am more than 18 years of age.